I know that I am not the first one and also not the least who chooses to travel like this. But after all the great experiences I had, I chose to share with others too. During all my travels I tried to be the best ambassador of my country – Romania, so controversial, but in the same time so beautiful. 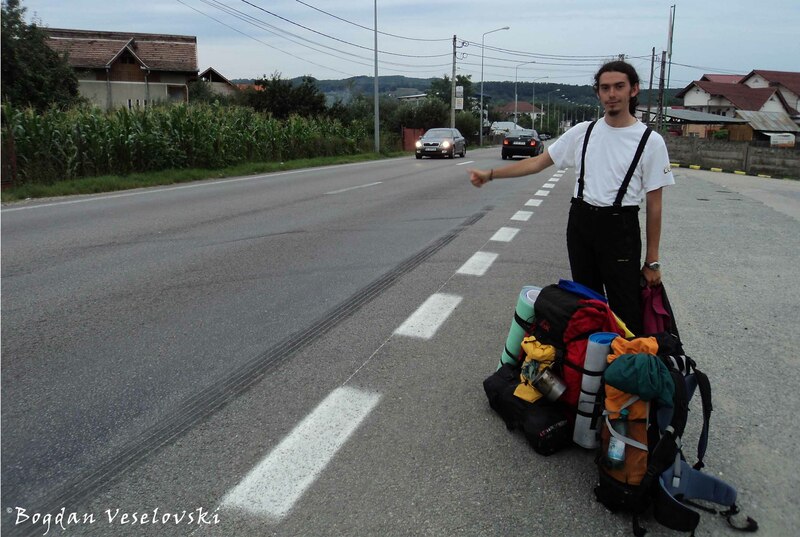 I started my first hitch-hiking trip abroad in the summer of 2012 after getting a lot of experience in Romania. And it was just the beginning. The more you see, the more you understand how big is the world and how short is your life. So, Carpe Diem! I realized that I don’t like to be an usual tourist; hitch-hiking, backpacking, CouchSurfing, wild camping are words could best describe my way of discovering the world. It is not about courage like many others say … maybe a little craziness – it is enough to be an optimistic guy ready to share a smile and to believe in people. The best part is not that you have the chance to travel with very little money, but the idea of meeting new people, talk to the locals see different mentalities, share and find out a lot of stories and tips for visiting, understand that you are very unique and in the same time not so different than others. Is great when you discover that every country has something to offer – even if we talk about cities, architecture, nature, traditions, food or people. Hitch-hiking (HH) was a popular means of transportation in the past due to the low transport affordability and the small number of vehicles. It is still practiced nowadays, but it is not so common anymore. A hitch-hiker should first be a traveler, otherwise is just a commuter, and to be a traveler you should also be a backpacker and why not, a couchsurfer, otherwise you’re just a tourist … because HH doesn’t mean just to catch a ride for free; it is first a way of sharing, socializing, meeting people. That’s why, in my opinion, traveling with ‘sharks’ or ridesharing don’t satisfy the conditions of the ‘real’ spirit of HH. As in any travel, even if you use your or other’s car, a bike, a train, a plain or just your feet, you need to know in advance your destination. Planning is the first step of organizing a trip; even if there are some hitch-hikers who don’t really care about this. I’ve met some of them who have all my appreciation. They just go … and leave … whenever … wherever … But for this you need first some precious time and free spirit, of course. Coming back to preparations … you first need to know where do you want to go and how many weeks/months you want to spend. A hitch-hiker’s trip is in general not a static one, so you need to take into consideration several cities, places, countries. Information is very accessible now thanks to the holy internet, so I’m sure that it won’t be a problem to find places of interest/touristic attractions in the city or region from your list. Allow a couple of days for each place and take care of the distances between them, because HH is unpredictable, so you should be somehow flexible with your schedule. After you know what places you will visit, go to the best hitch hiker’s guide – hitchwiki.org, a site where you can find so many tips like the best spots, public transportation to the exit of the cities/services areas and others’ experiences. It will be a good idea to print on some papers the name of the cities. It will help you to catch some rides faster. And, of course, think were you’ll gonna sleep. If you want to go for CouchSurfing, you should start in time searching for hosts. But keep in mind that CS shouldn’t be a site to help you finding a place to stay for free. CouchSurfing is about sharing, it’s about people, friends, experiences! Don’t forget to have some copies of your important documents on your e-mail and announce somebody about your itinerary. Don’t keep all your money in the same place. Try to keep your passport/ID with you, not in your bag.